Desilting and desilting kown as part of drilling mud cleaning is one important part of solids control system. While in solids control system, the desanding and desilting equipments are called desander and desilter, or combine them, as mud cleaner. In a solids control system, desilting is after desanding work, and depends on the drilling mud character, the desanding or desilting unit is not always need. GN Solids Control always can give our clients a appropriate solution. Desilting cones is the main and core part of the desilter. The dimension of the hydrocyclones is 4″. ZQJ 100s and ZQJ 100 is the usual model of GN, ZQJ100s means the desilting equipments with a small shale shaker. GN soldis control is one of the most important solids control equipment manufacturer. Derrick, NOV Brandt, Mi swaco are very famous US manufacturers on solids control equipments. 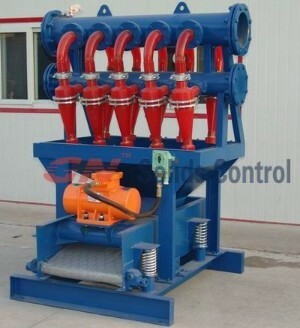 Drilling fluids desilting equipments (desilter) manufactured by GN solids control is very popular all over the world.